A new wireless display technology developed by Intel Labs allows a single screen image, such as a video playing on a laptop, to be shown on a whole wall of displays all working in unison, so that a piece of the original image is shown on each display. The technology is designed to make displays of all kinds more flexible and useful. This type of setup is sometimes used now at concerts to show a large image of the action on stage, or in a department store for advertising. But the displays typically must be connected with a jumble of HDMI or DVI video cables. Intel’s technology, on display Tuesday with other projects at an Intel Labs event in San Francisco, essentially “virtualizes” the pixels on a display, separating them from the underlying hardware so that they can be sent via Wi-Fi and reassembled on other screens for viewing. Intel calls the technology Display as a Service, or DaaS. The ability to mirror a display wirelessly onto another screen exists today, including Intel’s own WiDi (Wireless Display Interface). But those systems can connect only two screens, while DaaS can operate among a potentially limitless number of screens, said Greg Leeming, program director for the Intel Visual Computing Institute. 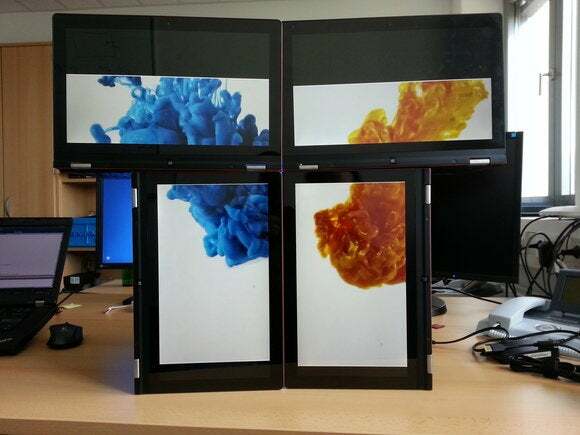 As well as taking the image on one display and breaking it up across multiple other screens, DaaS can also work in the reverse fashion—taking the displays from several laptops or tablets and showing them side by side on a single, larger screen, as shown above. That might be useful for collaborating at work, according to Intel. Four people could walk into a conference room and each have their laptop display appear on a big TV screen, for example, so they could all see what’s on each other’s computers. In both cases, the technology uses the H.264 video compression standard to compress what’s on a display so that it can then be sent wirelessly to other screens. It also uses Internet Protocol-based networking software to tell the video where to send itself across the network and how to reassemble itself. The software includes additional metadata that tells the video things like how many screens it will be displayed on and how they are spaced relative to each other, so that the resulting image appears as a coherent whole, without gaps or distortion. DaaS is a joint project of the Intel Visual Computing Institute, the German Research Center for Artificial Intelligence (DFKI) and the Computer Graphics and Telecommunication chairs at Germany’s Saarland University. Intel didn’t say if or when it might offer the technology commercially. If it does, DaaS will probably be offered in the form of an API (application programming interface) and a chipset to be used in displays such as TVs. The displays in the network would all need to be IP-enabled—as many modern TVs are—and they would need a piece of software installed so they can take part in the network of displays.